“Our coordination with the agencies in Chuuk, including the local police, was vital to the success of the shoal demolition. They provided invaluable manpower and knowledge to keep the area free of non-essential personnel, ensuring a safe blast,” said Lt. Zach Niezgodski, UCT 2 Construction Diving Det. Charlie officer-in-charge. “Everything UCT 2 is doing while we UCT 2 conducts underwater demolition to improve port access are here is an effort to assist the people of FSM and to improve the functionality of the Chuuk Cargo Port.” In addition to the shoal demolition, UCT 2 will provide a range of operations improving the wharf area, including inspecting of existing navigational aides; assessment of the wharf; exploring the port for future deepwater mooring locations; and placing environmental offsets at popular scuba diving sites which will protect the coral reef from damage due to boat anchors. 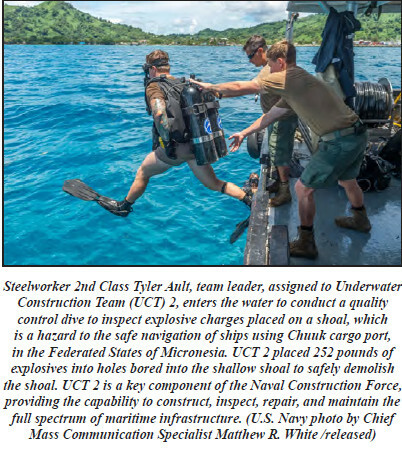 UCT 2 provides construction, inspection, repair, and maintenance of waterfront and underwater facilities in support of Navy and Marine Corps operations. 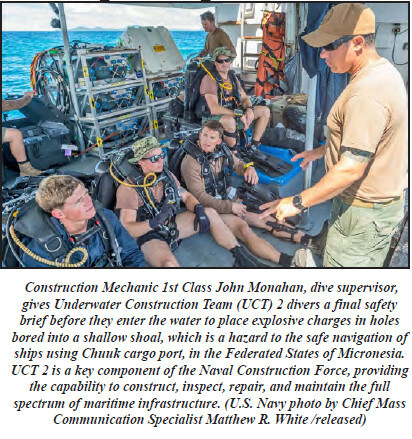 UCT Seabees have the unique ability to perform shallow, deep water, and terrestrial construction. Valiant Shield is a U.S. Only, biennial field training exercise (FTX) with a focus on integration of joint training in a blue-water environment among U.S. Forces. This training enables real-world proficiency in sustaining joint forces through detecting, locating, tracking, and engaging units at sea, in the air, on land, and in cyberspace in response to a range of mission areas.